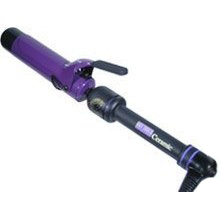 The Leading Professional Curling Iron, Now in Ceramic! Features patented Pulse Technology. Fast heat up, maintains constant even heat, from low to extra hot. Creates curls with extra hold. Reaches temperatures up to 428 degrees. Ceramic preserves moisture and eliminates frizz. Eliminates damaging hot spots. Easy to clean and inhibits bacteria and odor bulidup. The Leading Professional Curling Iron, Now in Ceramic! Features patented Pulse Technology. Fast heat up, maintains constant even heat, from low to extra hot, while you style. Creates curls with extra hold. Reaches temperatures up to 428 degrees. Ceramic preserves moisture and eliminates frizz. Eliminates damaging hot spots. Easy to clean and inhibits bacteria and odor bulidup. One Year Warranty from Hot Tools.